Letter enclosing a 5 dollar donation to help A random child at Berry Schools. There is also noted an intent to send a package of clothes at a later date to be used at the discretion of the school. The letter is also one of a personal nature dealing with the health of an friend of Martha Berry. 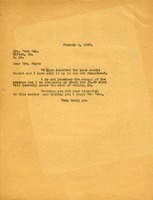 Letter to Dr. Beach stating that Miss. Berry has been away from the Schools for some time but would appreciate the honor of the first honorary member of the Young Atlanta Quota Club for Women. A letter thanking Mrs Key for a pine needle basket that was sent to the Berry Schools art department. The letter also included to check to pay Mrs Key back the postage.